Even though there is no electricity plus a lot of mosquitos in the village and its surrounding, my journey this time is quite interesting because I was be able to acrossed the Tulang Bawang River with klotok boat. It’s a small boat with the tok tok sound from it machine. As a city dweller, I never had such an experience. Not to mention seeing the river itself, and hearing some stories from the villagers about the crocodiles that lives in it. It takes only 20 minutes flying from Jakarta (Soekarno Hatta Airport) to Radin Inten Airport in Bandar Lampung. From there you may need another four to five hours car rides to Dente since the road condition is very bad. The only main road, which is Jalan Lintas Timur, built with loans from Japan Bank for International Cooperation. You can run your car smoothly in here. 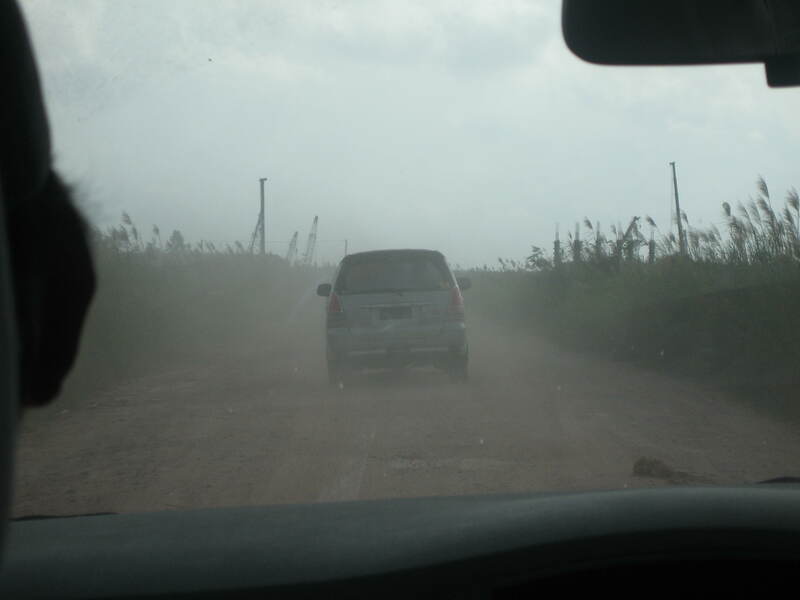 The other road is dirty and stoney, causing you to have only 20 km per hour speed plus shaky ride. When the road is dry, you may not be able to see the road ahead clearly, the air would be filled by dust. But when rain comes down, it may take longer to get to the destination since the road slippery with mud. Because of poor infrastructure, no wonder Dente stuck in poverty for years. It’s not a popular place. Even one of my editor, M. Syahran Lubis, who used to live in Lampung for 25 years and his mother originally from Tulang Bawang, said he never heard the name of the village. Actually, Dente has prospects. Not far from the village you could find a big shrimp exporter PT Central Proteina Prima Tbk (who acquired Dipasena), million acres of sugarcane field belong to a big sugar company owned by Gunawan Jusuf, and also the third world biggest canned-pineapple producer PT Great Giant Pineapple of Gunung Sewu Group. People in the area lives from that companies, or plant their own yard with cassava, palm, pepper, or making their own tambak udang (shrimp pond/farm). By the way, there is one thing that amazed me: the sugarcane field. You can see it from the distance when you’re heading to Dente. Green, there’s nothing but green. The driver, who took me a ride, said the sugarcane field stretch 80 km in wide and 150 km in length. He said if we could pass the road inside the field, the car would run faster, up to 80km per hour. But to pass the field would require good driving skill, because the driver have to deal with a lot of big trucks carrying sugarcane crop comes along the path. Unfortunately, I was unable to pass the field. The sugar company forbid people from certain area to pass their field. Well, I hope I can visit the vast sugarcane field someday. *first upload in facebook notes on August 20, 2008. This entry was posted in Places and tagged Bandar Lampung, Central Proteinaprima, Dente Teladas, Great Giant Pineapple, Gunung Sewu Group, klotok, Lampung, pineapple, Radin Inten Airport, shrimp pond, Sumatra, Tulang Bawang by Pudji Lestari. Bookmark the permalink.